purāsīn nanda-pariṣat-paṇḍito bhāgurir muniḥThe scholar Devananda Pandit knew the meaning of all the Puranas. Previously, he was Bhaguri Muni, the scholar in Nanda Mahārāja’s court. Sarvabhauma Bhattacharya’s father was named Mahesvara Visharada. 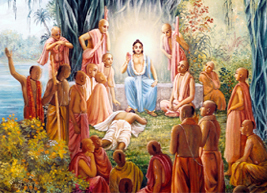 Mahāprabhu visited his house, which was situated on an embankment. Devananda Pandit, a peaceful Brahmin who desired liberation, made his home nearby. The Lord delivered Devananda Pandit in the town of Kuliya. According to Bhakti Siddhānta Sarasvatī Prabhupada, Kuliya was a suburb of Nabadvīpa situated on the west bank of the Ganges. In that time, the central part of the town of Nabadvīpa, also known as Mayapur, was situated on the eastern bank of the river. The modern city of Nabadvīpa stands on the site of the former Kuliya, which is known as the place where offenses are forgiven (aparādha-bhaṣjaner pāṭa). Proof of this is found in the old names of many neighborhoods, such as Koler Ganj, Koler Daha, Gadkhali Kol. Each of the nine islands of Nabadvīpa Dhāma represents one of the nine types of devotional service. Koladvipa is the island of service to the Lord’s lotus feet (padasevana). The word kola has been distorted into the popular speech as kuliyā. The word kol also means a boar (varaha). The Lord revealed His Varaha Form to Vasudeva vipra in Satya Yuga. Just look–this is Visharada’s embankment. Here the Lord met Devananda Pandit. He chastised him for the offense he had committed to Srivas Pandit, which caused him to repent. From the above evidence from Chaitanya Bhagavata, Chaitanya Charitamrita and Bhakti ratnākara, it is clear that Devananda Pandit’s house, was somewhere near to the house of Sarvabhauma Bhattacharya’s father, Mahesvara Visharada. It is thus clearly indicated that his school (ṭol) was situated somewhere in Kuliya village. Devananda Pandit was a scholar and an ascetic who had been indifferent to the world from an early age. Although he had won a reputation for his erudition, he nevertheless had no feeling of devotion to Kṛṣṇa and so failed to understand that bhakti is the ultimate purport of the Śrīmad Bhagavatam. Being a mumukṣu, or one who seeks impersonal liberation, mokṣa, Devananda Pandit praised dry austerities and renunciation, and did not speak devotional purports to Śrīmad Bhagavatam. One day, Srivas Pandit came to hear a Bhagavatam recital at Devananda Pandit’s house. As he listened to the text of Śrīmad Bhāgavatam, Srivas Pandit became absorbed in a mood of loving devotion and started to cry. Devananda Pandit’s faithless disciples threw him out of the assembly for causing a disturbance. Since Devananda Pandit did not object to the action of his students, he was responsible for their offense to a devotee. For this reason, Mahāprabhu was thus angry with him. The Lord said: “Whoever recites Śrīmad Bhāgavatam without glorifying devotional service is an ignorant fool who knows nothing. This rascal recites Śrīmad Bhāgavatam and never mentions bhakti. I will go and tear up his manuscript, just watch Me. Some time after Devananda Pandit committed this offense to Srivas Pandit, Mahāprabhu passed nearby his house and saw that he was engaged in giving a discourse on Śrīmad Bhāgavatam. He became angry and rebuked him severely for his lack of faith in the Vaiṣṇavas. Just as blasphemy of the devotees makes one deprived of the Lord’s mercy and destined for downfall, glorifying them and engaging in their service is the best way to find the mercy of the Lord and become freed from all sinful and offensive activity. Through great good fortune, Mahāprabhu’s dear associate Vakresvara Pandit came to stay at Devananda Pandit’s house. 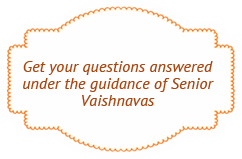 Because Devananda took excellent care of Vakresvara Pandit, Mahāprabhu softened towards him. Previously, Devananda Pandit had been completely without any faith in the Lord, but when he heard of Mahāprabhu’s glories from Vakresvara Pandit, his attitude changed. Through the association of the Lord’s devotee, he began to develop a taste for pure devotional service. Devananda was a scholar of Śrīmad Bhāgavatam, but it was through Vakresvara’s mercy that he was able to understand its meaning from Mahāprabhu. Mahāprabhu told Devananda to explain Śrīmad Bhāgavatam in terms of devotional service. It was Devananda Pandit’s great fortune that he was able to receive the mercy of the Lord in the form of a chastisement. Devananda Pandit was a great pious soul, for Mahāprabhu verbally punished him. The chastisement of Chaitanya Mahāprabhu is the greatest pious act. Even if one should die as a result of the Lord’s punishment, he still goes to Vaikuntha. Devananda Pandit received this mercy due to living in Kuliya or Koladvipa, the place where offenses are forgiven. Gopal Chapala was also forgiven his offenses in Kuliya. Devananda Pandit’s disappearance day is celebrated on the kṛṣṇā ekādaśi of the month of Paush.